I didn't even realize when I was doing it that there was a reason I was doing it. 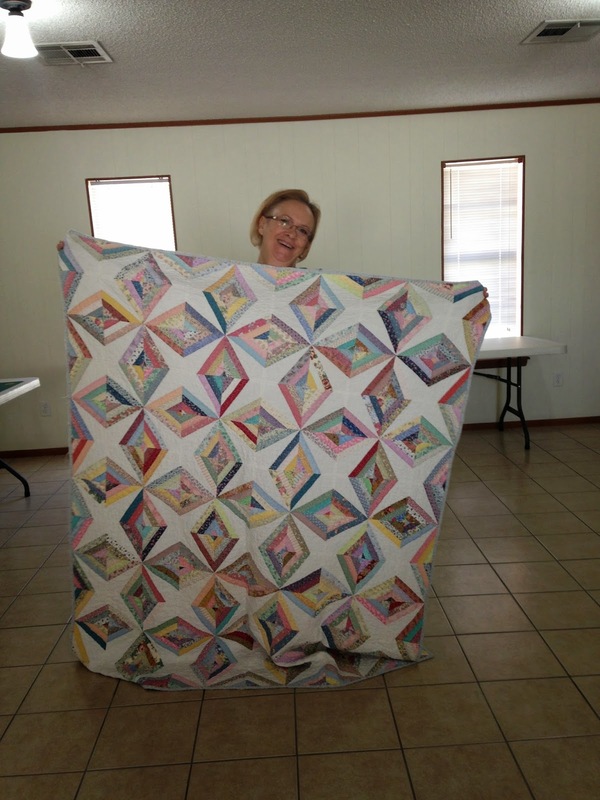 Yesterday at our UFO group, Robin was going to show us how to make a String Kite Quilt. She had made one years ago in a guild she belonged to in another town. This is hers. 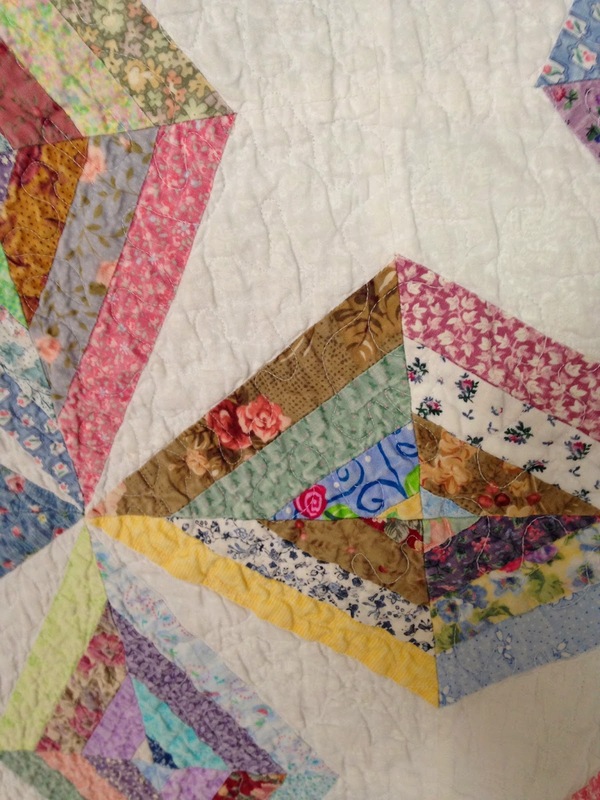 Although a lot of the fabrics aren't 30's prints, some are and it really reminded me of a 30's style quilt. It is so sweet, just like Robin. So we came to UFO's equipped with background squares and strips, lots of strips. 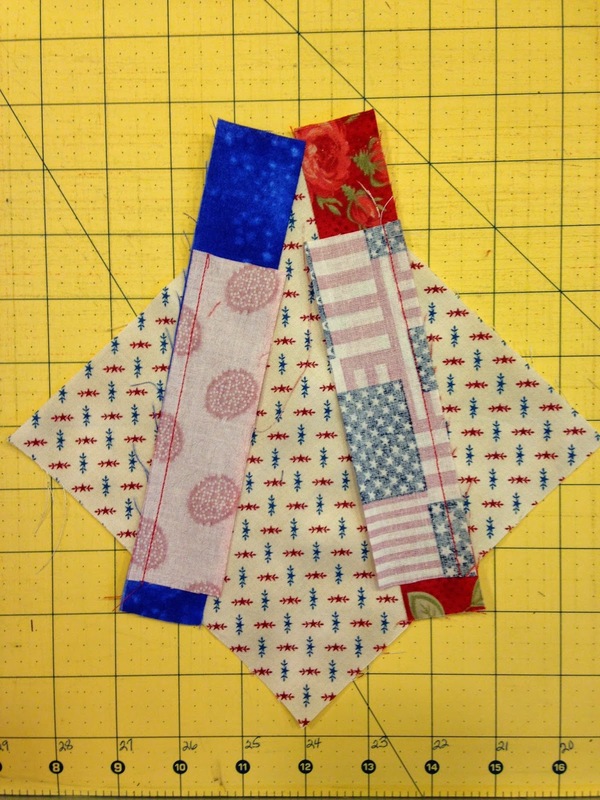 Of course, me being the red, white, and blue fan that I am, Mine is out of patriotic prints. And while working on it, it occurred to me. 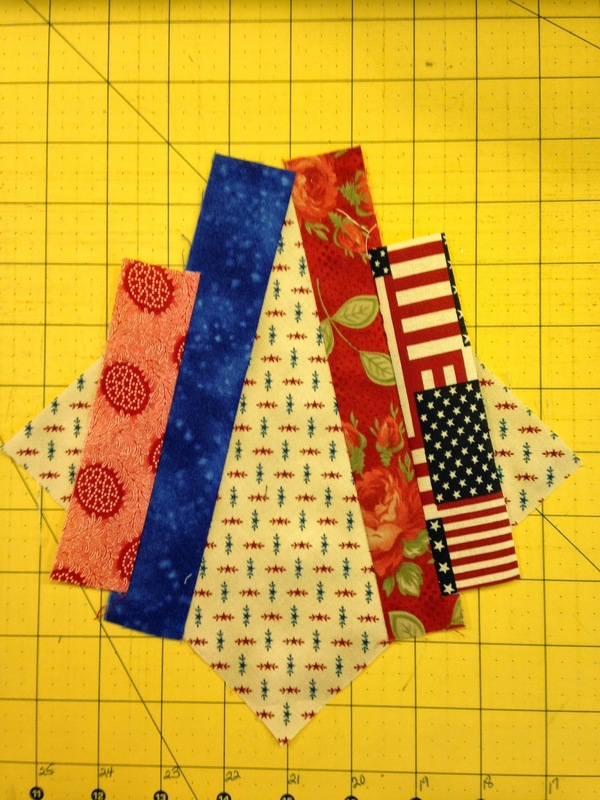 Oh my gosh, tomorrow is the anniversary of 911 and look what I'm working on. 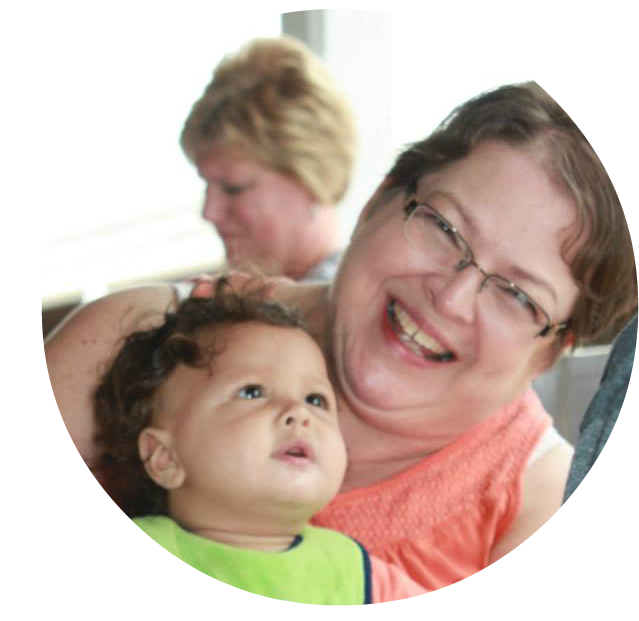 I'm going to show you how you can make one too. 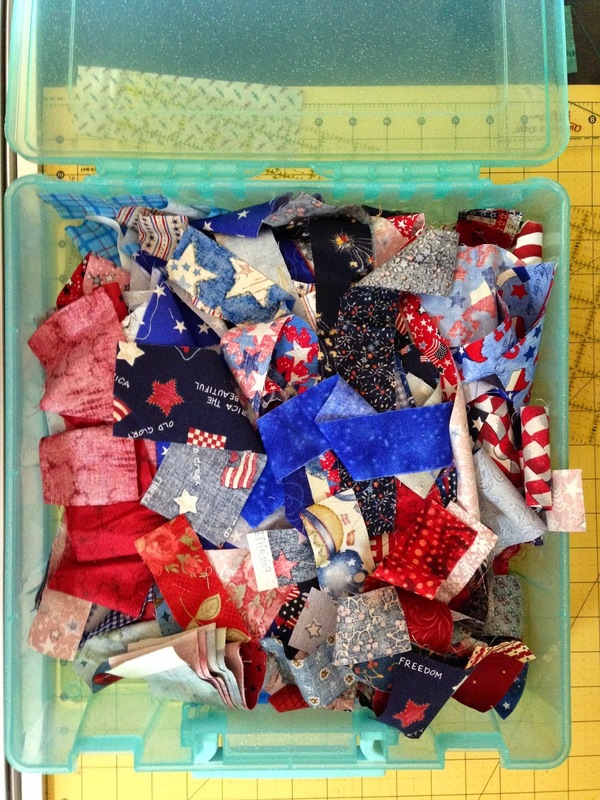 You can make yours out of 30's or red, white, and blue, or just scrappy; whatever makes you happy. 2. Yardage for your background squares. 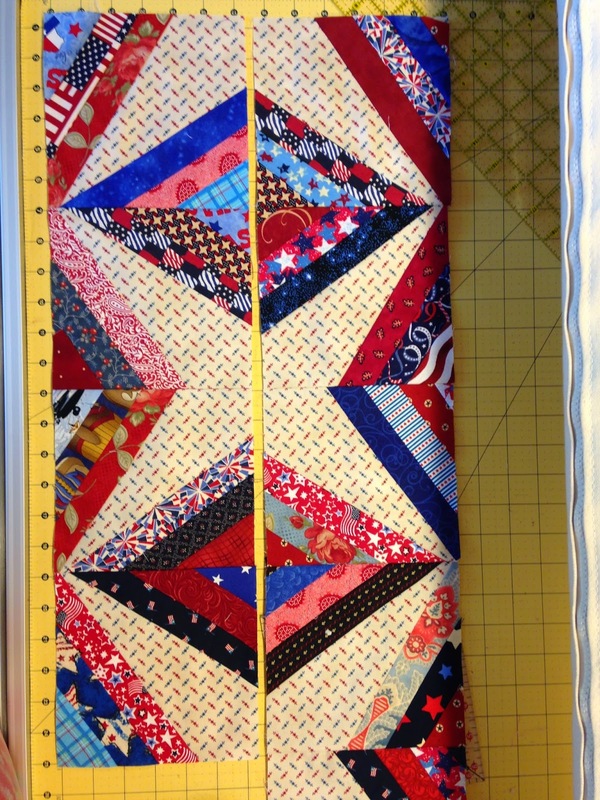 I don't know how much to tell you as it will depend on how big you want to make the quilt. 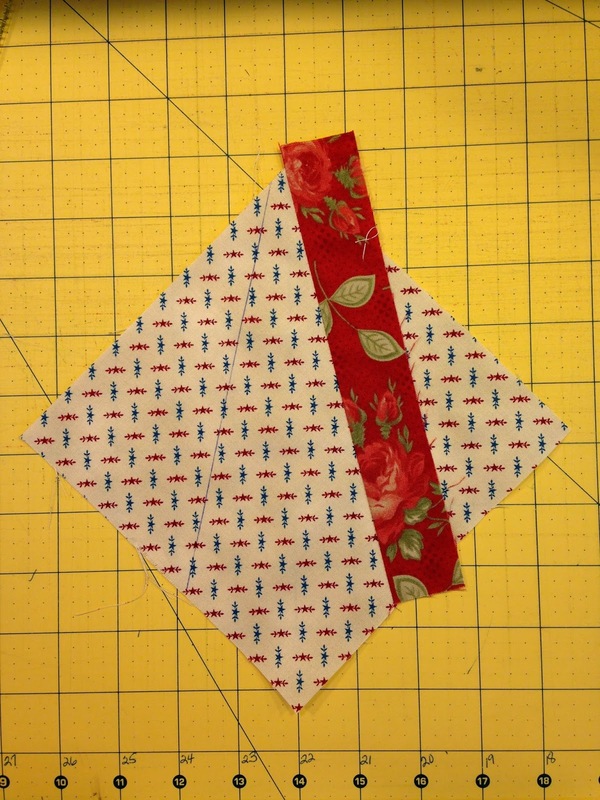 I can tell you that you can get 6 - 6 1/2" squares out of a width of fabric. It also depends on how you want it to look. 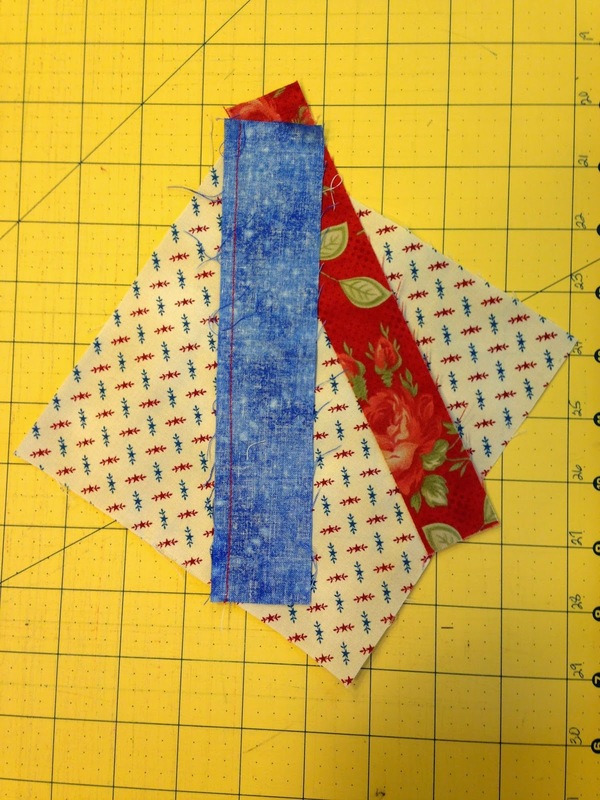 Do you want the squares all out of the same fabric or do you want them scrappy. 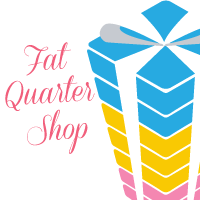 I'm going to make a twin size (12 across and 15 down) so I need 180 - 6 1/2" squares. 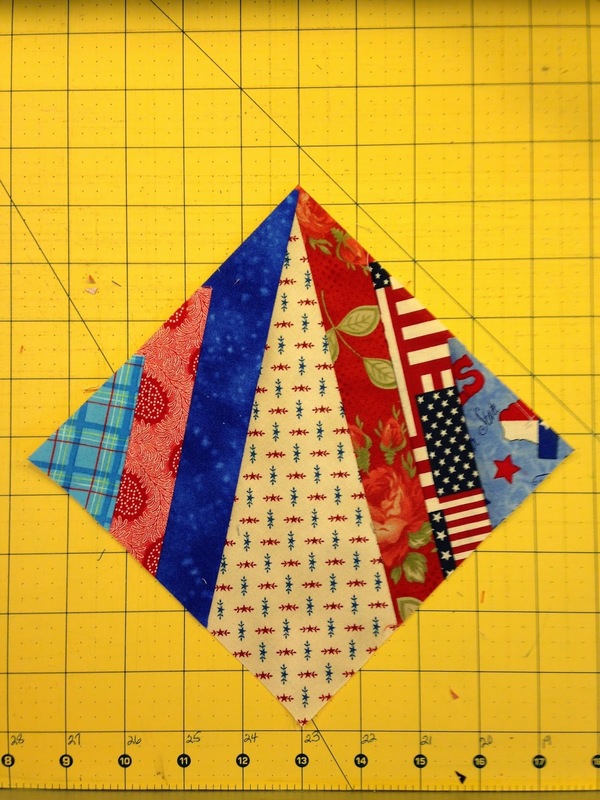 That equates to 5 1/2 yards total for the background. Cut a 6 1/2" square out of a light weight cardboard, Mylar sheet, cereal box, what ever you have that you can use for a template. Yep, we're going old school for a little bit. 2. 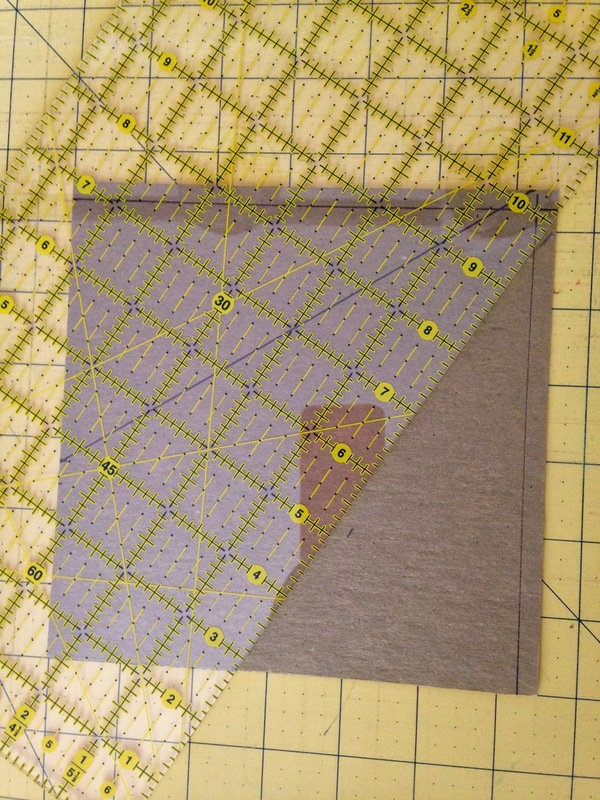 Draw a 1/4" seam allowance line along two intersecting sides. 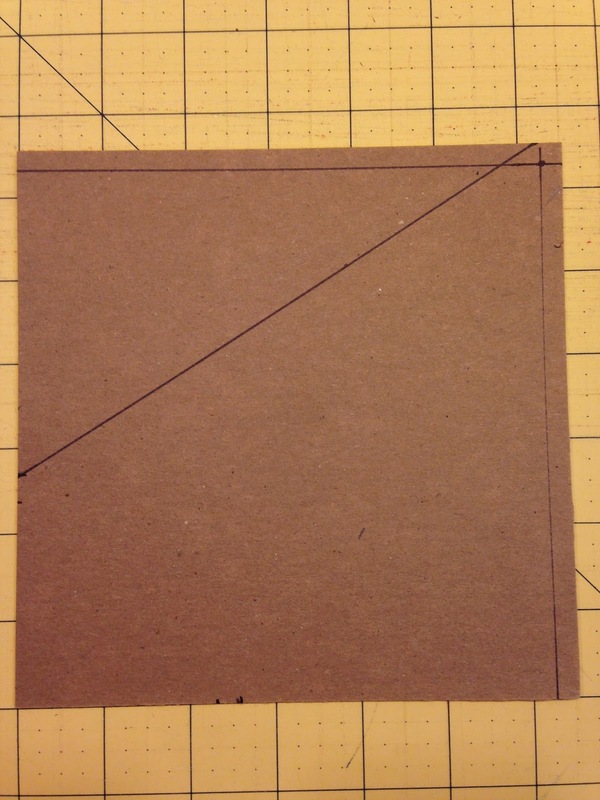 On the opposite two sides, make a small mark 2 3/8" in from the corner. 3. 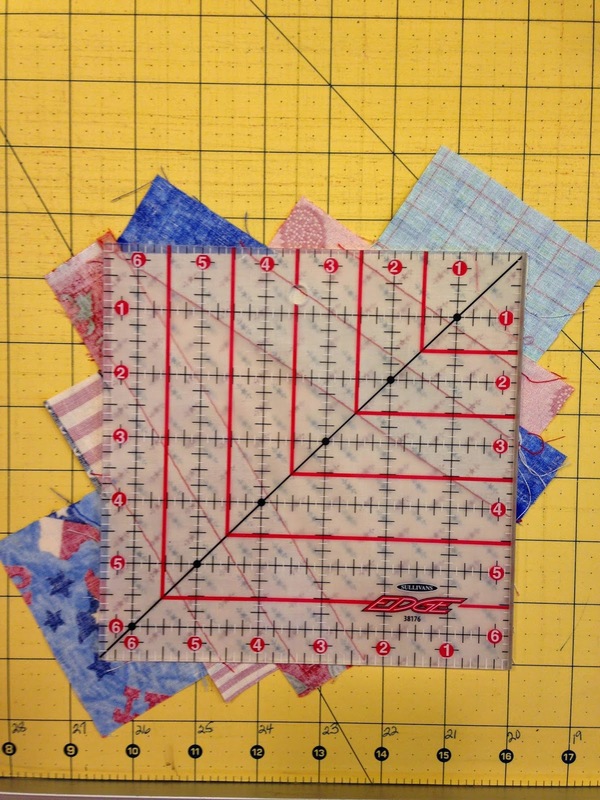 Lay your ruler's 1/4" seam allowance line on the 2 3/8" mark on one edge and the 1/4" seam allowance line on the intersection line at the opposite corner. Draw a line. 4. 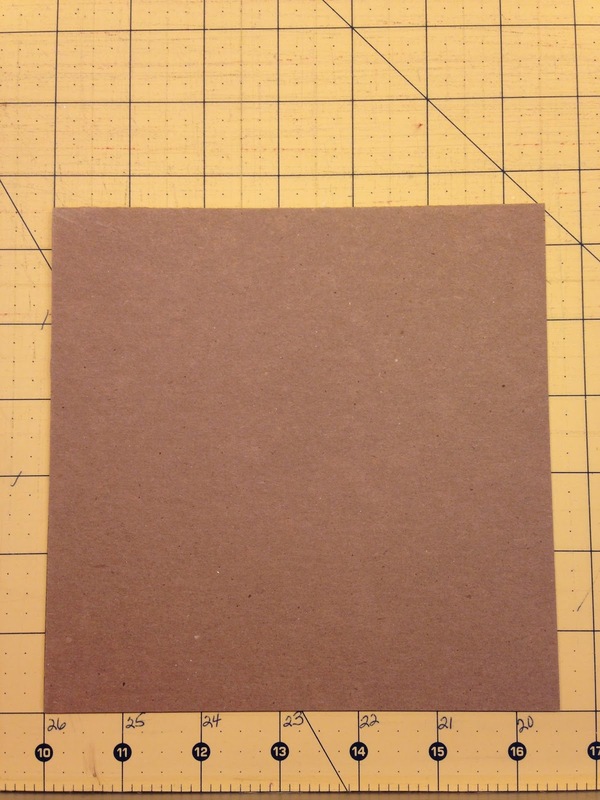 Do the same thing to the other side of the cardboard template. It should now look like this. 5. 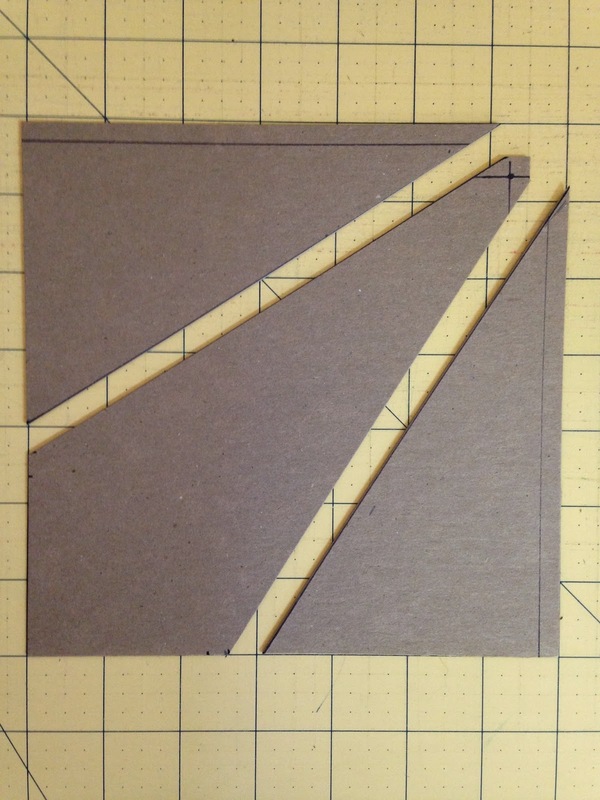 Cut on the each of the diagonal lines you drew in step 4. 6. 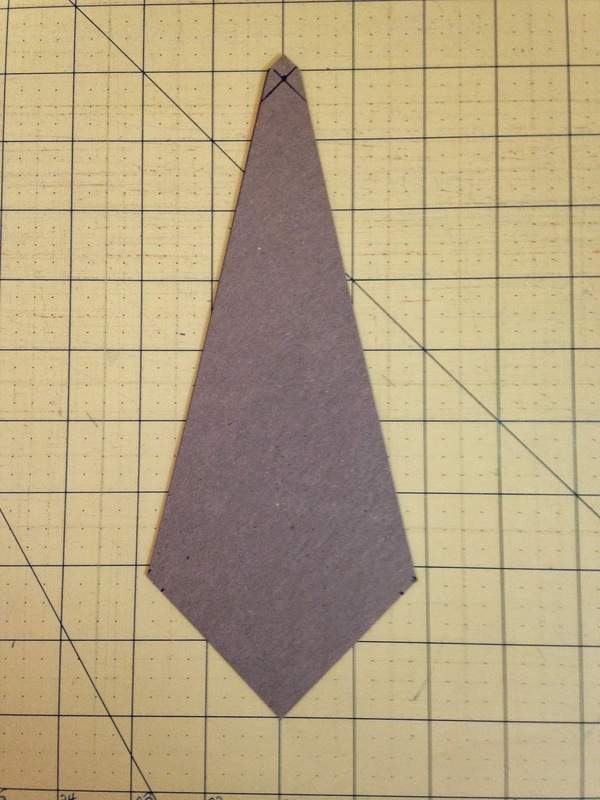 Discard the outer triangles, leaving you with your template for your kite. 7. 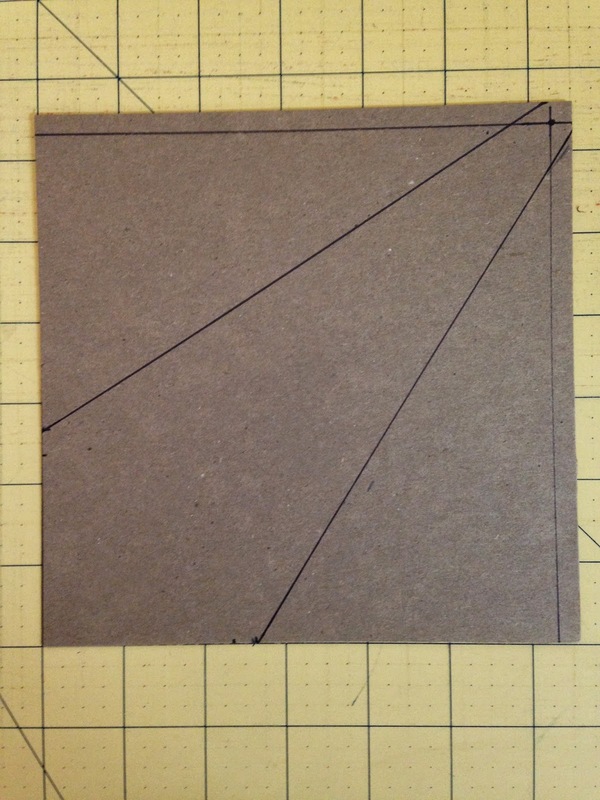 Lay the template on the right side of your 6 1/2" background squares and draw a placement line on the background square on each side of the template. I hope you can see my drawn placement lines. 8. Now RANDOMLY pick a strip from your strip container. Mine looks like a tub of worms! 9. Place the strip right side down on top of the background square (right sides with be together) with the edge of the strip even with the edge of the drawn line. 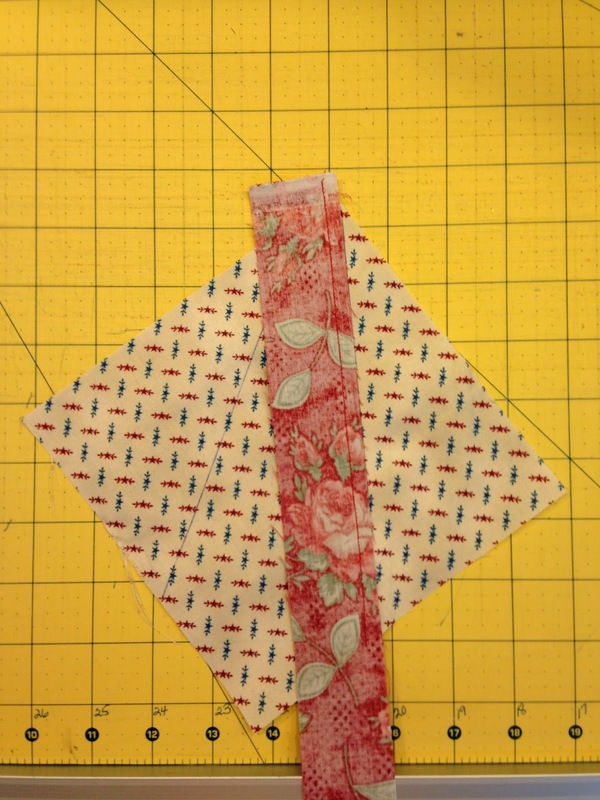 Sew 1/4" from the edge of the strip. 11. 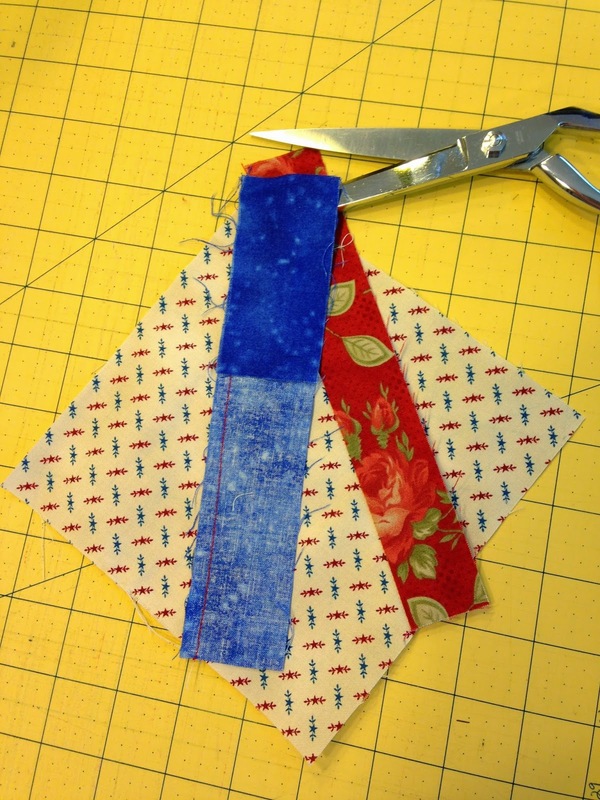 Flip the strip over the stitching and seam allowance and press to the right side of the background square. 11. Do the same thing to the left side of the drawn line as in steps 8, 9, and 10. 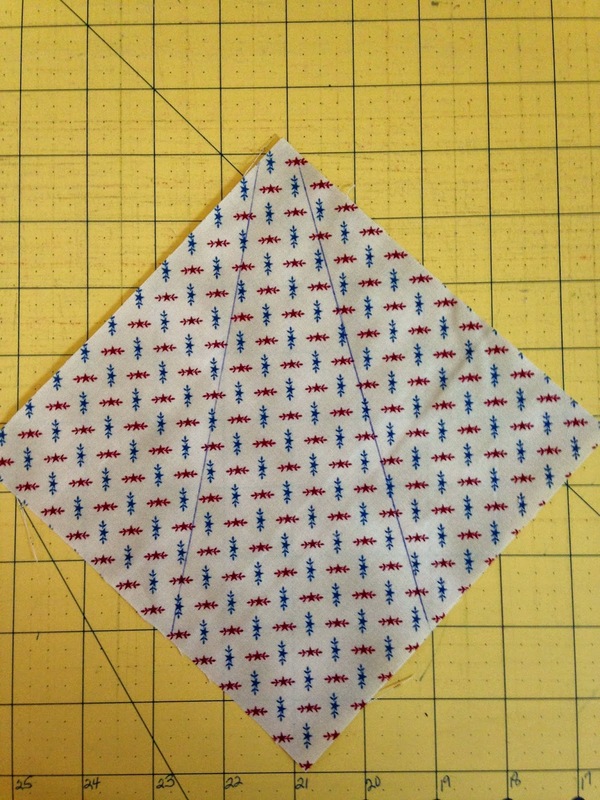 When I cut my strips off at the end, I just fold them back on themselves, slip the scissors in the fold and cut it on that fold. 12. Repeat this process with a second strip on each side. 13. Repeat the process with a 3rd strip. As you can tell in the picture, I used a wider strip on the 3rd round as a 1 1/2" strip lacked just a smudge from getting all the way to the corner and I didn't want the bulk of a seam allowance in the corner or that close to the corner. 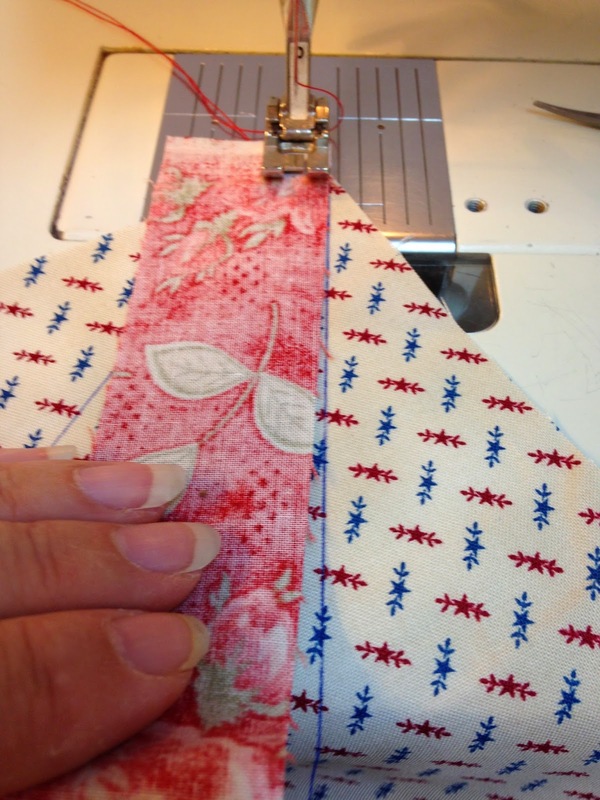 Some of the ladies didn't have to add that wider strip, it just depends on your seam allowance accuracy and your strip cutting accuracy. 14. Now you're ready to square off the strips. I like to place my square up ruler on the back of my block so I can see my original background square. 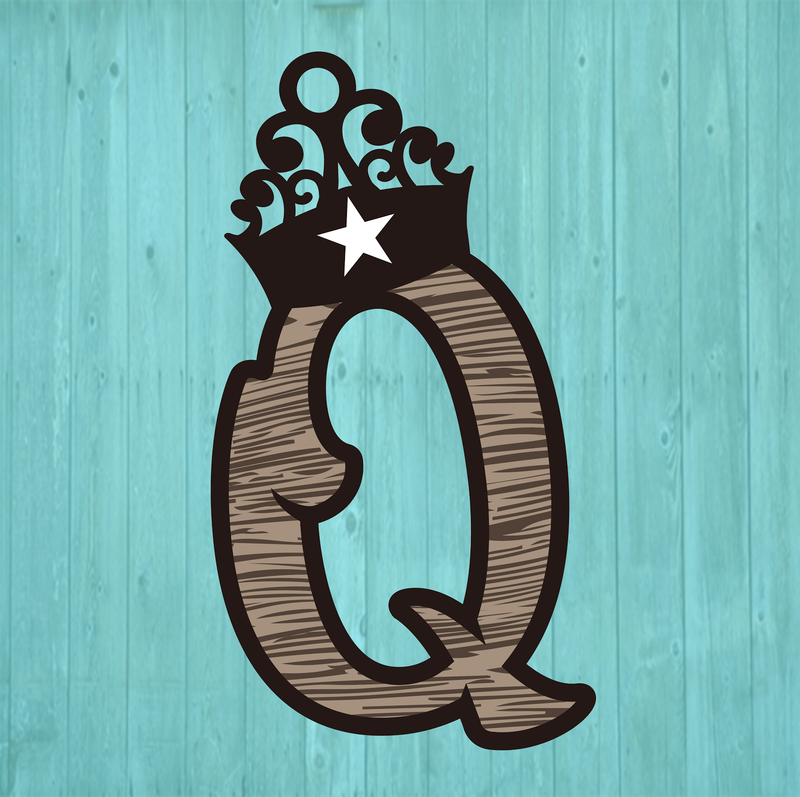 I square the ruler up withe the bottom background (wide part) and the opposite point. Cut off the excess on all 4 sides. 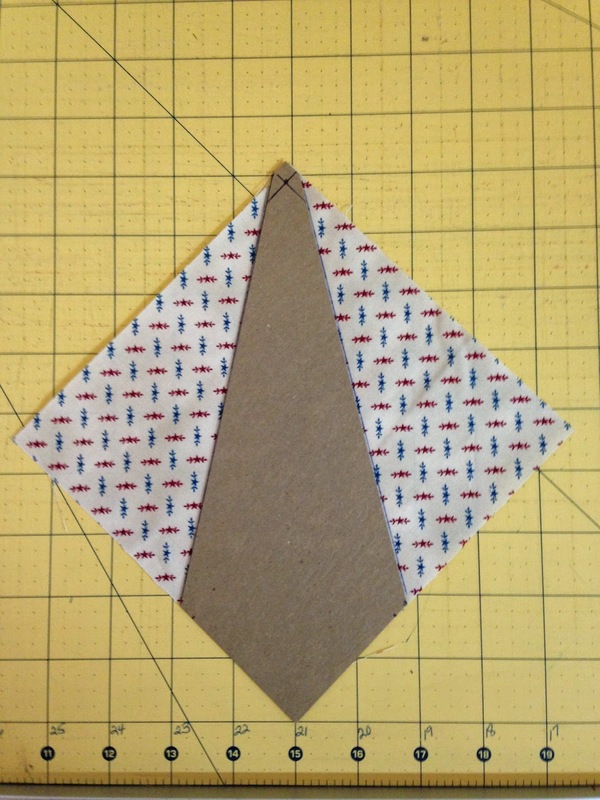 And here is your first block in your string kite. 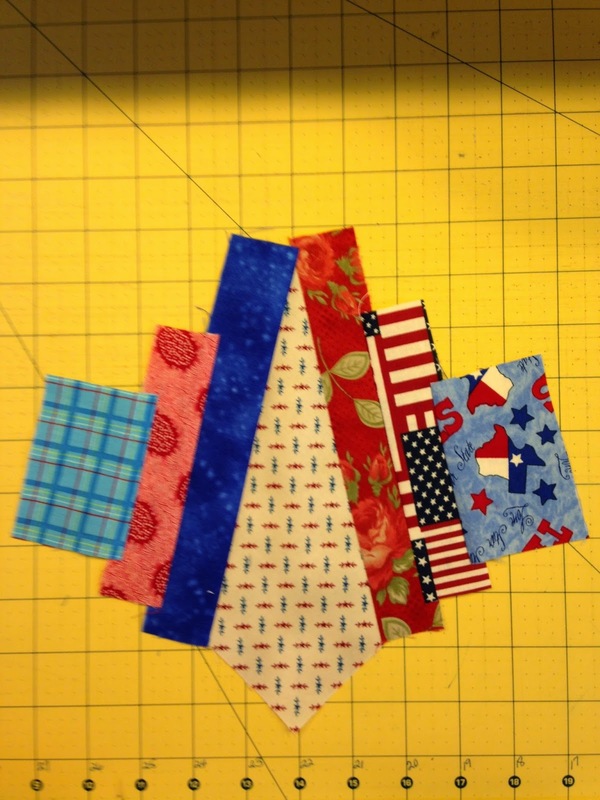 I made 24 blocks in a matter of about 3-4 hours at UFO's and have them sewn together in 2 rows. That's 24 down and 156 to go to make it twin size like I want. I don't have the 2 rows sewn to each other though. I laid them out so you could see how it's coming together. I'm loving it! I can't decide if I should make the background scrappy or if I should order more fabric and make the background all alike. What do you think? 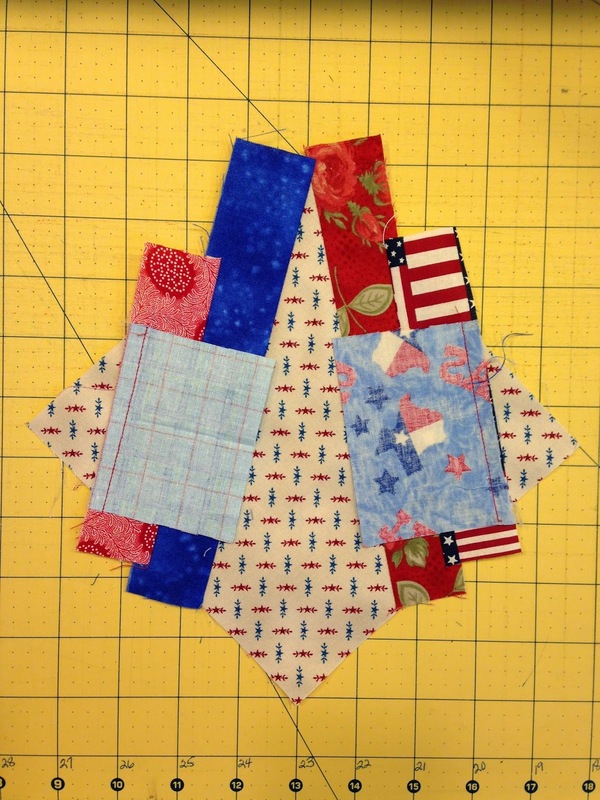 I will forever remember this quilt as my 911 quilt and will reflect on 911 every time I see it. I will also forever remember where I was when I heard the news. I worded at Vinyard Farm and Home Supply, no longer in business :( in Nevada MO as the "bookkeeper". My office was upstairs in the "crows nest" and had a large window that I looked out over the store. We had walkie talkies that we used to communicate with staff on the floor and in the office. We also had a Radio Shack franchise in the front corner of the store and of course that Radio Shack had TV's. I remember seeing one of the cashiers going over to turn the TV's on (like each morning routine) and then coming over the walkie talkie and saying, "OMG did anyone else just hear this news?" We all flocked to the front of the store and were glued to the TVs in Radio Shack. Needless not much business was conducted that day! 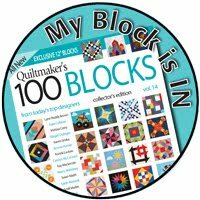 I love the way you made these blocks. 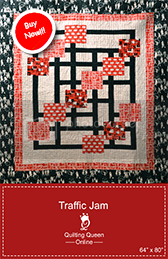 Your instructions may encourage me to use this pattern for a prayer quilt. 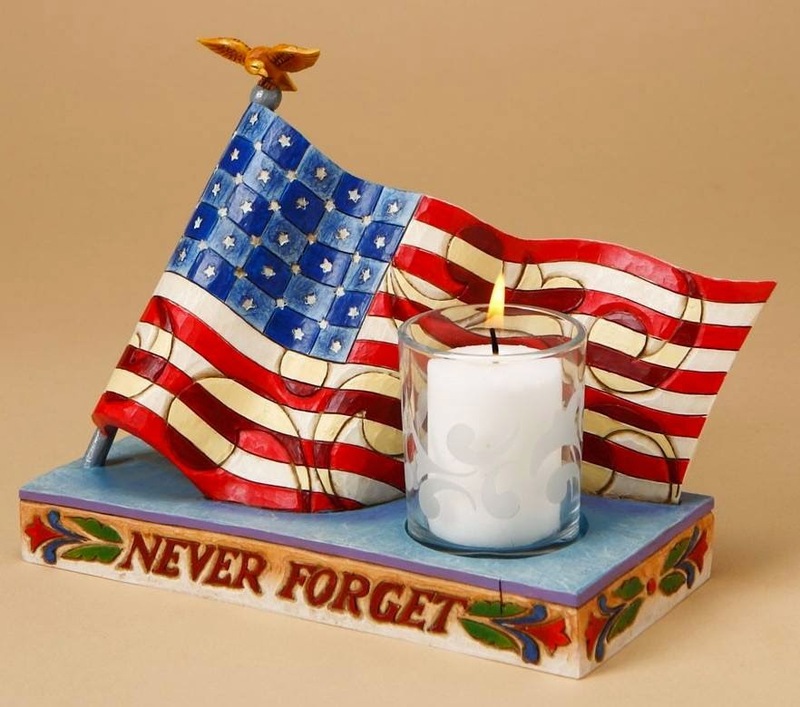 I doubt than any of can ever forget where we were when we first learned our nation had been attacked. I would be quite happy if we never have any more of those "memorable" days! 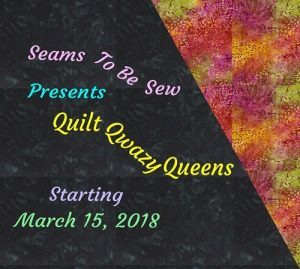 I used the exact same pattern to make a quilt for my parents 60 th Anniversary. The back ground was light and I got every member in our family to write a memory of them in the space. Even the greats did it. What a great heirloom. My parents were thrilled! They have since passed and now I have it. It was a labor of love! Worked up quickly too. I entered a comment but I don't see it so will try again. Doris, thank you for this tutorial. I finally understand how to build this block!